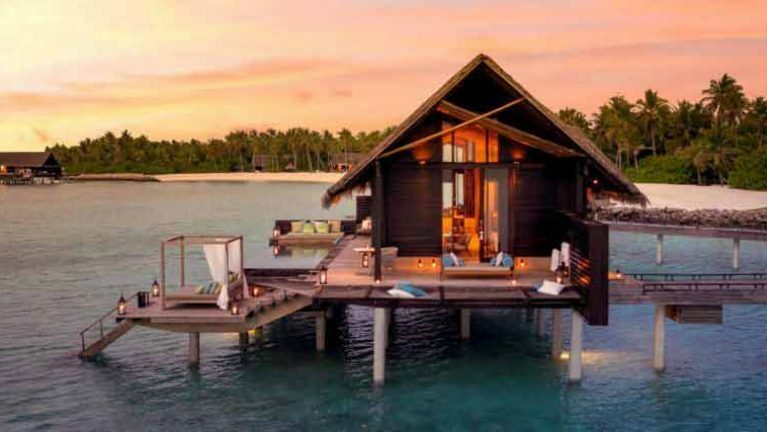 One and only Reethi Rah is an exclusive resort for those who demand privacy and luxury at the best. Approximately 50 minutes by Luxury Yacht or 15 Minutes by seaplane flight from the capital city, to reach this exclusive private island (one of the biggest in Maldives) in North Atoll. Reethi means beautiful and this resort is a slice of paradise in itself. Beautiful beaches, great facilities, and most importantly great people serving the guests, is what One and Only Reethi Rah is known for. Beautifully designed villas stand above the ocean or amidst the lush foliage and endless sandy beaches, fusing modern flair with traditional architecture. One and Only Reethi Rah offers 130 private resort villlas. Very much isolated along the beach segregated by rich tropical greenery or set over the crystal clear water of the tidal lagoon. 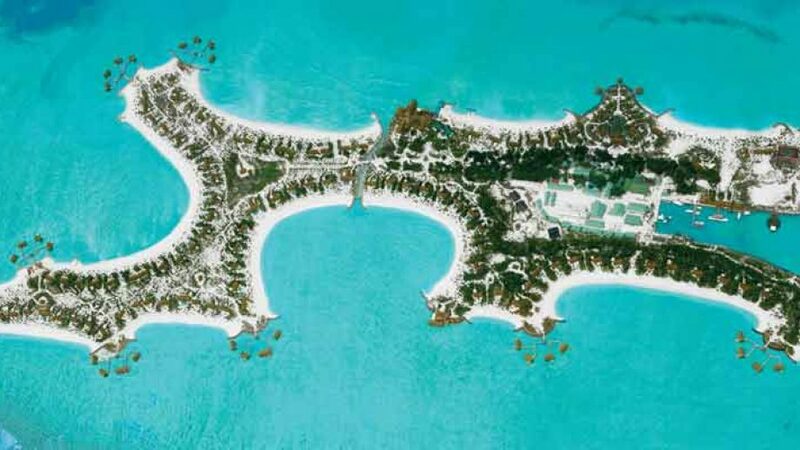 Outlined in a rich contemporary style these are among the biggest resort villas on the planet. With an eye towards flawlessness the resort includes its own natural Chef Garden and specialty items, for example, Kobe beef and Toro from Japan are delivered all the time. 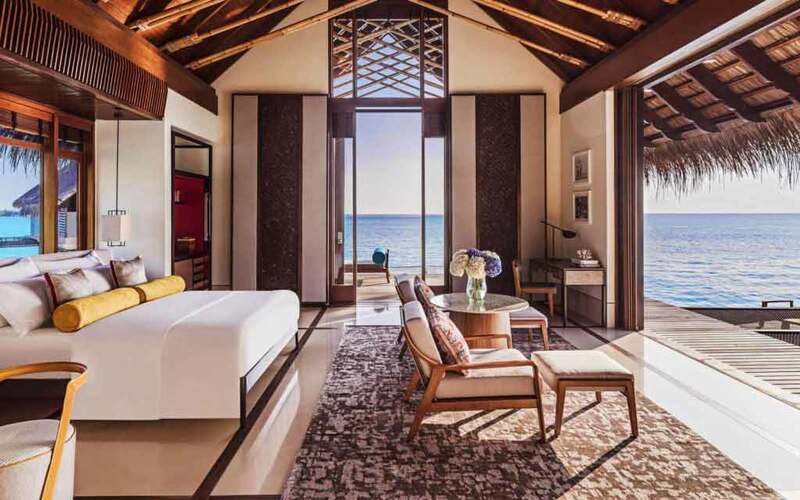 At One and Only Reethi Rah island chic is the keynote for evenings and the inventive and crisp cuisines are set up with passion and flair. Set in the heart of ocean, guests can indulge in various activities including diving, snorkeling, swimming. Resort can be reached by shared luxury yacht, shared seaplane or private speedboat transfers. Seaplane transfers are available during day light only (6 Am to 4:30 Pm) daily. Veiled in the lush vegetation, one and only spa is a spiritual journey. Step into this private sanctuaries and indulge in personalized treatments and massages tailored to cater the needs of the guests. Soothing massages is accompanied by panoramic view of the ocean. The spa offers separate male and female relaxation area, swirling vitality pool, crystal steam rooms, sauna, manicure, pedicure, healing pool of Wastu. Book before 31st May 2018 & receive 10% Discount on room rates. Offer not applicable to group bookings (bookings above 5 villas). Combinable with all offers except "Family Offer". 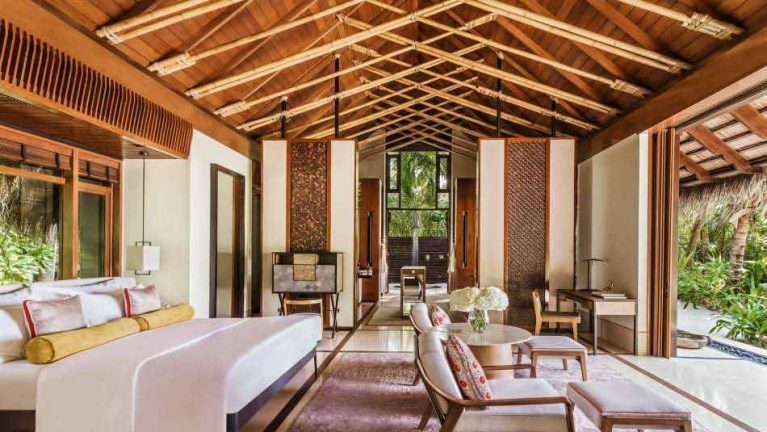 Hidden in the lush foliage, beach villas are ingeniously designed with fusion of modern flair with traditional architecture. 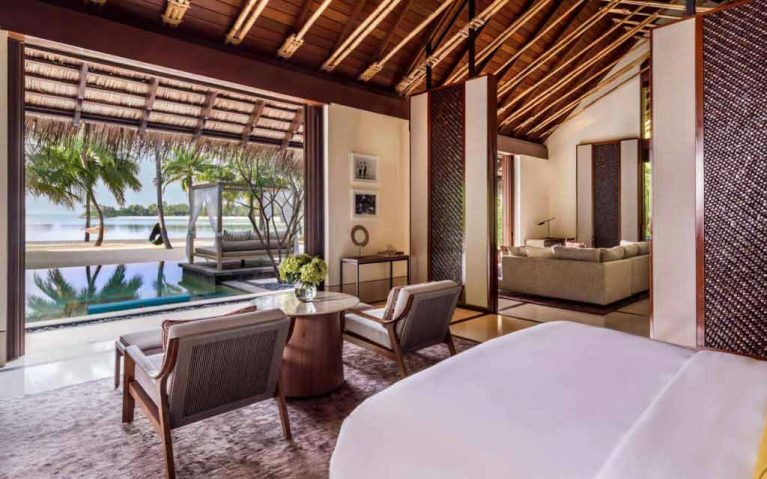 36 beach villas are expansive and comfortable, opening up to a private verandah featuring sun bed, open air shower and leading directly to private beach. The bedroom is elegant with king size bed or two queen size bed. The bathrooms are spacious with oversized bathtub, shower and complementary bathroom amenities. Minibar, Shower, Bath, Safety Deposit Box, Telephone, Air conditioning, Hairdryer, Bathrobe, Radio, Desk, Seating Area, Free toiletries, DVD Player, CD Player, Fan, Toilet, Patio, Bathroom, Slippers, Satellite Channels, Cable Channels, Flat-screen TV, Sofa, Hardwood/Parquet floors, Wake-up service, Dining area, iPod dock, Sea view. Veiled in the lush foliage, beach villa with pool adds charm to allure beach location. With an extensive outdoor exteriors it offers a private pool, outdoor dining area, daybed. Soak up in the sun, walk in the sandy beaches at beach villa with pool. Indoors, the villa is well furnished and well equipped with elegant bedroom featuring a king size bed or 2 queen bed, en-suite bathroom with oversized bathtub, shower and complementary bathroom amenities. Minibar, Shower, Safety Deposit Box, TV, Telephone, Air conditioning, Hairdryer, Bathrobe, Radio, Desk, Seating Area, Free toiletries, DVD Player, CD Player, Fan, Toilet, Patio, Bathroom, Extra Long Beds (2 meters), Slippers, Satellite Channels, Cable Channels, Sofa, Hardwood/Parquet floors, Wake-up service, Dining area, iPod dock, Private pool, Wardrobe/Closet, Sea view. Tranquility and peace of the ocean soothes your mind at water villa. Perched over the ocean, relish the comforts of the private sundeck featuring hammocks suspended over the water and sun loungers. Suspended over the turquoise blue ocean, enjoy the cool breeze coming straight from the ocean, invigorating sounds of waves at water villa with pool. With expansive outdoor featuring a private pool, hammocks suspended over water, sun loungers it is a perfect place for stargazing and sunbathing. Minibar, Shower, Safety Deposit Box, Telephone, Air conditioning, Hairdryer, Bathrobe, Radio, Desk, Seating Area, Free toiletries, DVD Player, CD Player, Fan, Toilet, Bathroom, Slippers, Satellite Channels, Cable Channels, Flat-screen TV, Private entrance, Sofa, Hardwood/Parquet floors, Wake-up service, Dining area, Electric kettle, iPod dock, Towels/Sheets (extra fee), Private pool, Wardrobe/Closet, Sea view, Coffee machine. 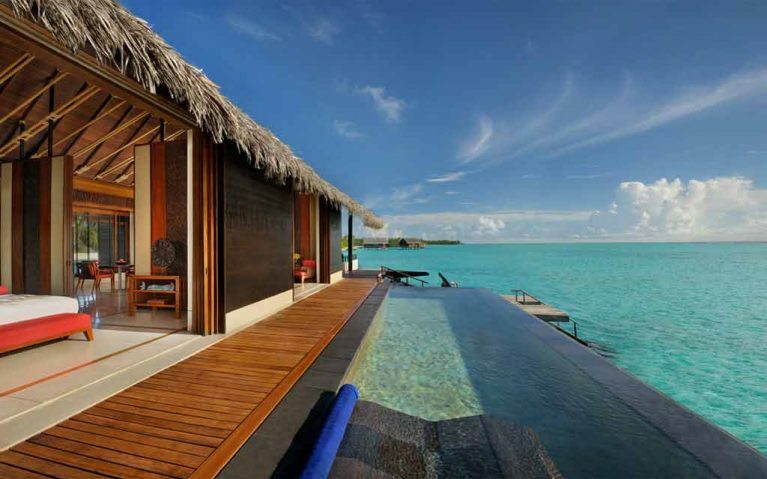 Spacious and majestic, grand water pool villa is the best water villa offered. 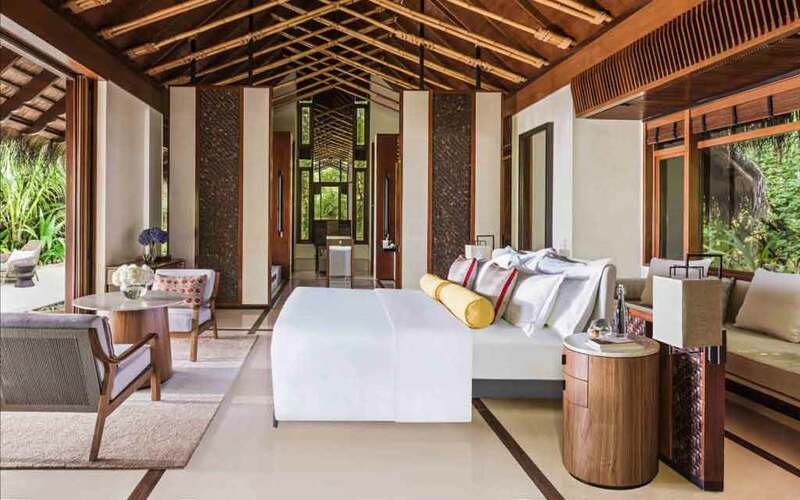 A sanctuary of serenity and privacy relish the cool breezy moments from your private sundeck, soak in the sun at Jacuzzi, have a private dinner stargazing, take few lapses in private infinity pool. Minibar, Shower, Bath, Safety Deposit Box, Telephone, Air conditioning, Hairdryer, Bathrobe, Radio, Refrigerator, Desk, Seating Area, Free toiletries, DVD Player, CD Player, Fan, Toilet, Patio, Bathroom, Slippers, Satellite Channels, Cable Channels, Flat-screen TV, Sofa, Hardwood/Parquet floors, Wake-up service, Dining area, iPod dock, Private pool, Wardrobe/Closet, Sea view. Grand beach villa with pool is exclusive private villa designed with comfort, elegance and complete relaxation on mind. Bespoken luxury, this villa has plush indoors and outdoors. 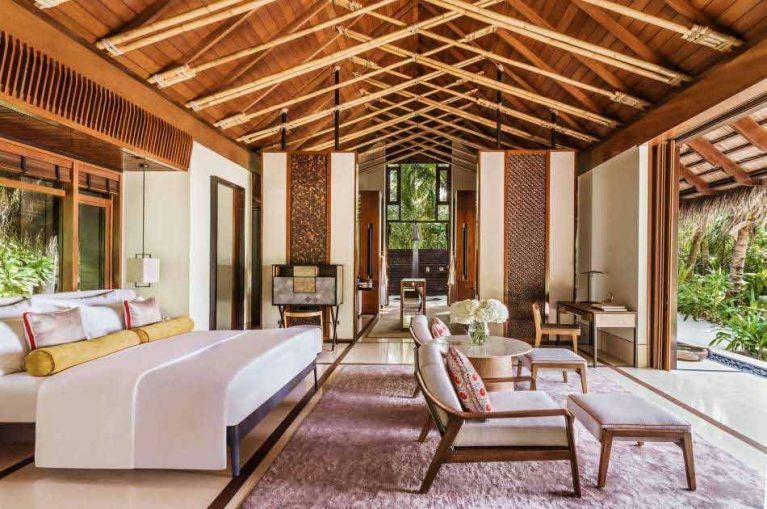 Indoor, the villa features two bedrooms with king size bed, separate dining and sitting room, and a spacious bathroom with a luxurious soaking tub designed for two, intimate showers, bathroom amenities and undistributed view of the lagoon. Outdoor, the villa features a private pool, canopied day bed, dining area stretch to the sea. A perfect place to soak in the sun. Minibar, Shower, Bath, Safety Deposit Box, Pay-per-view Channels, Telephone, Air conditioning, Hairdryer, Bathrobe, Radio, Desk, Seating Area, Free toiletries, DVD Player, CD Player, Fan, Toilet, Patio, Bathroom, Slippers, Satellite Channels, Cable Channels, Flat-screen TV, Sofa, Hardwood/Parquet floors, Wake-up service, Dining area, iPod dock, Private pool, Wardrobe/Closet, Sea view, Towels. Romantic dinner or private dinner or fine dining, One and Only Reethi Rah restaurant’s delivers it all. Reethi Main restaurant which stands over the water providing guest impeccable service and personalized attention. It’s a wonderful dining experience at this restaurant enjoying the cool breeze and a fusion of foods ranging from Far East, Middle East or the Mediterranean. Tapasake Located in the west beach, Tapaske provides an unforgettable view of the sunsets. This Japanese restaurant provides various fresh sea foods and sushi to choose from. Botanica 100% natural sustenance and wine in the mystical setting of the culinary specialist’s garden. Fanditha Set across the white sandy beaches at the northern tip of the island guests can enjoy their meals watching the ocean. Rabarbaro New dining experience at One & Only Reethi Rah offering a variety of exquisite Italian cuisines. The beach club at clubOne Enjoy fresh salads, seafood and grill served with magnificent views of turquoise lagoon. Rah Bar it’s a poolside bar, with live music and variety of tropical drinks. Sip your drink and party all along. Fanditha Bar A boho-chic, beach side hideaway where Indian ocean sunsets and Arabesque influences create magical evenings. Epicure Wine cellar catered with exceptional privileged experiences.